Shop at Home has a WILD deal for today only or while supplies last. 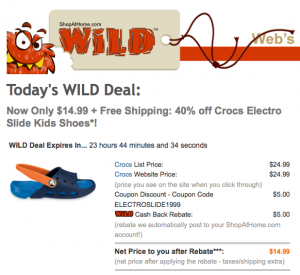 The deal is for Crocs Electro Slide Kids Shoes. The are priced at $24.99 p you can take $5 off with discount code: ELECTROSLIDE1999 an you also get $5.00 cash back. Your final cost is $14.99 after cash back.